A spirit camp has opened on the White Earth Reservation to carry on the water protectors’ traditions started at Standing Rock. The camp is working to stop the Enbridge Line 3 proposal as well as promote unity among camps across the country doing the important work of protecting Mother Earth, according to William Paulson, Executive Director of the Oshkaabewisag Community Cooperative. Enbridge has an old and failing Line 3 (the black line on the map). Enbridge proposes to abandon that line in the ground and install a new, larger pipeline along a new route (the red line on the map.) That new route runs 337 miles across Minnesota, crosses the Mississippi headwaters and endangers clean lakes, rivers and wild rice beds, and all for nothing. Minnesota’s fossil fuel demand is actually declining. Paulson said Enbridge Line 3 also crosses what is known as the “1855 Treaty area” (light green shaded area on the map). The Anishinaabe retain rights to hunt, fish and gather wild rice in this area. Enbridge and the state “are not discussing it on a government-to-government basis,” he said. [Enbridge is] trying to buy people off and go through.” The threat to the Mississippi’s headwaters is “unacceptable,” Paulson said. We are promoting unity with camps that are carrying the movement started at Standing Rock forward; one of our support groups is Unity Walkers and also we are a construction location for the Sacred Trash Raft that will be going down the Mississippi to New Orleans. We are a Safe and sober area for the community of the White Earth Nation that shares teachings of the Annishinaabe. Self Sustainable lifestyle is the model of the camp incorporating Solar and Wind technology into day to day living. We are also traveling to Michigan to create ‘feet on the ground’ awareness at the Mackinaw Bridge site for tomorrows Hydro test of line 5 by Enbridge. In July I will be speaking at the Oregon Country Fair on the continuation of a movement also. Gardening and seasonal harvesting of wild foods is taught and shared along with uses of various wild plants. We will transition thru the seasons including Wild rice harvest as we prepare for the winter. We will be a year round sustainable community. For more on Enbridge Line 5 in Michigan, click here. 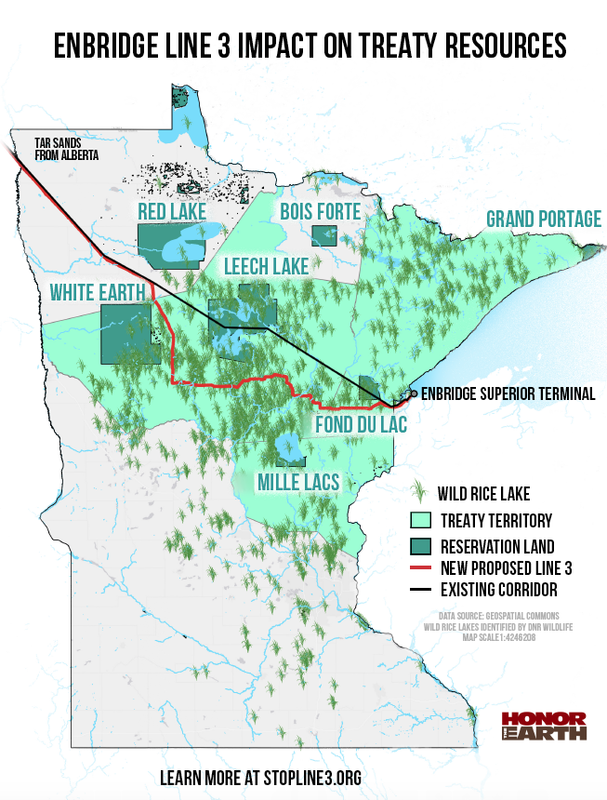 Public Hearing, Tuesday, June 13: The Minnesota Department of Commerce recently released a draft Environmental Impact Statement (DEIS) on Enbridge Line 3 and is holding hearings to get public comment. The only metro area hearing is Tuesday, June 13, 6-9 p.m. at Intercontinental Hotel Saint Paul, 11 E. Kellogg Boulevard. The Department of Commerce will rewrite the DEIS based on public comment. The final EIS will play a significant role in the Minnesota Public Utilities Commission’s decision whether or not to approve the proposal. Please come and make your voice heard! Line 3 Teach-In, Thursday, June 29: To learn more about the Enbridge Line 3 Tar Sands Pipeline proposal, attend a Teach-in on Thursday, June 29, at Walker Community United Methodist Church, 3104 16th Avenue South in Minneapolis. Doors open at 6 p.m. for networking, a panel discussion will be followed by small group conversations so people can practice how to talk about this issue with friends, neighbors and coworkers. There also will be opportunities for action, including signing petitions or writing letters to the Governor and/or the Public Utilities Commission. The event is co-hosted by Honor the Earth, Healing Minnesota Stories, the Facilitating Racial Equity Collaborative (FREC), and the Sierra Club’s North Star Chapter. Youth from Honor the Earth are helping to organize and lead this event.